In a time of socially engaged art, Charge asks artists to consider not only intersecting with other organizing fields, but that within our art field itself, there are issues of equity at stake. Our aim is ultimately that not only artists who can afford to work for free get to create our culture - but that everyone has access to add to our public imagination. Charge was born in the context of Houston touting its arts in its pitch to be considered a world class city, fore-fronting its arts in bids for the Superbowl, advertising its arts as a way to attract and retain the workforce of major industries here, and making policy around the arts within the recently created cultural plan. But in the midst of all this attention to “the arts” actual artists did not have a voice at the table. Being artists, we thought, let’s build our own table. So over the past four years in a convening hosted by Art League Houston, we platformed artists who have inspirational models of sustaining both their work and their lives, artists whose work intersects with activist communities, and artists who consider their work in relation to the larger economy. We did this in 2014, 2016, and most recently at Project Row Houses. It was a way for us to share knowledge and support alternatives horizontally, starting and centering on artists from the start. 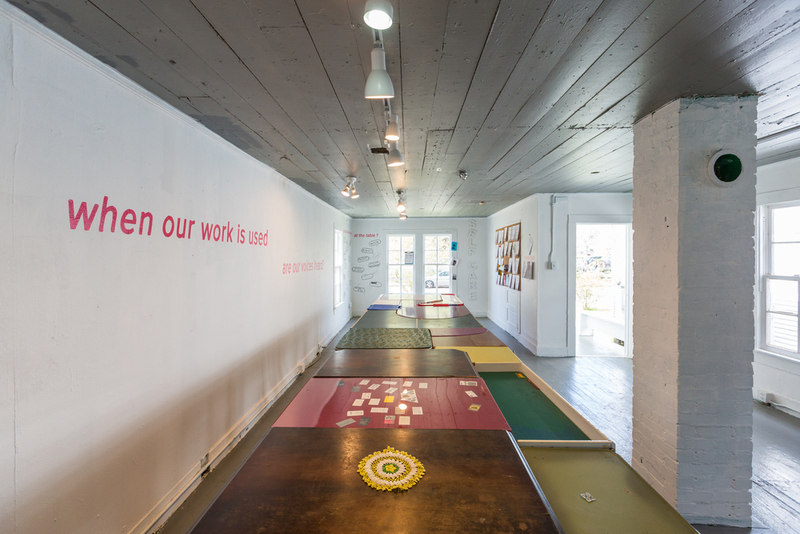 In the Charge house at Project Row Houses as a part of Round 44: Artists, Activists, and Instigators, we built the material version of the metaphoric table in our mission statement. This 20 foot table, collaged out of many tables, attempted to create a level platform to the range of voices around it. We reached back, hosting Mel Chin for an intimate dialogue with 20 younger artists who find inspiration in his body of work that reaches outside of the art world to lead poisoning, soil remediation, and culture jamming. We reached inside, hosting a series of self care events that Jennie piloted including a zine making drink and draw with ZineFest, a ReCharge nap haven with Emily Sloan, and a “Calling in Sick” workshop by Taraneh Fazeli to consider how our own personal reproductive labor is vital especially as we try to remake the world. We reached back in, hosting Kenneth Bailey from the Design Studio for Social Intervention to consider what artists have to bring to the table on issues like the Houston Equal Rights Ordinance, or popular discourse in the presidential race. We also secured him an audience with the Houston Arts Alliance in partnership with Sixto Wagan and the University of Houston’s Center for Art’s Leadership where at least seven times he avowed the imperative of partnering with community organizers of integrity. We reached around with Sharbreon Plummer and John Pluecker’s Spectrogram, physically picturing our negotiations for individual and collective progress. We reached out, with Amanda Hart convening Houston adjuncts in their first meeting towards the formation of a citywide union, as well as in Houston Has a Labor History? hosting and recording a range of storytellers as they brought to light narratives from an under shared history of organizing, inserting other flows into the dominant mythos of a very “business friendly” neoliberal city. We are writing this open letter to officially announce our retirement from Charge. Although we have loved getting to bring these dialogues together in our city, and are thankful to have had the opportunity to work with so many powerful and insightful voices, we have decided that for reasons both personal, social and political, it is time for us to both take a step back from Charge. Jennie Ash: I'm trying to practice a little bit of self care and be mindful of personal burnout since I already have a full-time job. Charge takes a lot of work and we are only two humans. Carrie Schneider: Charge was sparked by an inequitable experience of showing my work within existing institutional arts infrastructures. The prevalence of extractive “opportunities” for artists passing as supportive made me pause my own practice in order to work on advocating for more relevant and equitable support structures for our work. Knowing that I will have a safety net- of my mom’s teacher retirement because she passed away before she could claim it- allowed me to say things more loudly with less fear of being blacklisted than many other artists can afford. Her life insurance also allowed me to put a down payment on a house which makes my life possible, holds my studio, and means I won’t get priced out of neighborhoods as real estate follows artists. Being acutely aware of this special privilege made me feel adamant that having a voice at the table in the industry of which we are the primary producers should not be an exceptional privilege, it should just be how it is. I feel like we launched the conversation, but I don’t want to be in the constant role of pushing it forward, or else it is no more multi-vocal than the inequitable structures Charge has aimed to present alternatives to all along. Now I’m eager to get back to making work, and also to putting it up around the city and outside of walls like before. Jennie Ash: Personally, I feel like I have been able to program conversations that touched on topics I felt were important at the time, such as advocating for better standards of artist compensation, understanding the value that artists bring to the table, recognizing artists as public intellectuals, adjunct organizing, and self care. I feel though its time to pass the torch over to the next generation of creatives in Houston, to show us what we were doing wrong and how it could be done better. Carrie Schneider: Jennie and I got to curate three rounds of incredible discussions, games, and presentations. We feel like the framework is lively and people are tuned in so now other voices should have a chance to should fill it in. Jennie Ash: Money, it's been so tough funding Charge. Each year it’s been an uphill fight to fund-raise to meet the equitable fees we were so dedicated on paying for Charge. Again we are only 2 people, so to fund this and program the event, is a huge amount of work, and in fact is a full time job. We thank all the artists and individuals who have helped us fund Charge thus far, as well as Art League Houston without whom it would not have been possible, Project Row Houses, Houston Arts Alliance and Texas Commission on the Arts. We also thank all the people who believed in the project, and helped us navigate the muddy waters of arts funding. Carrie Schneider: There is a lot of support for workshops that teach artists how to manicure their resume, how to fill out an application, how to be better at being like professionals in other fields. Charge was for artists sharing what we uniquely have to bear amongst ourselves in order to create more, not less, biodiversity of thought when it comes to what good work done well may look like and who it can be for. Many artist service organizations and arts education institutions do the work of professionalizing artists through careerist self-help circuits to help them better serve within the flows of power that exist in our world. Charge was for sharing mutual support among those who remake our world. Charge’s version of being in service of the arts is that 1. All kids have access to arts education 2. All artists are paid 3. Everyone can be an artist if they want. What if the wide middle of dark matter artists twisted the space they occupy inside out, so that instead of serving a narrowing pyramid scheme, they refuse to be exploited, and refuse to be instrumentalized to exploit those around them? Maybe the first step of that was asking this mass of artists how they feel about someone getting funded for using their work when they are not paid. Seems like the next step for me as an artist is to acknowledge that I need more grace than I thought, I’m grateful to have had a platform for a while, and now I’m eager to get back to Not Knowing, knowing that I have a lot to learn. Both: We would love to see the energy of Charge continue to manifest itself here in Houston, through organizations who are already receiving funding to do this kind of work, and/or through the imagination of the next generation of artists, curators, organizers, researchers, and educators. Have a clearer understanding regarding the value of artists as public intellectuals and what they can bring to the conversation around arts policy, civic life, the public imagination, social justice and social change. Recognize that artist’s should be paid for their work, no matter what. Are aware that Houston has a rich history of creative interventions, alternative models of sustainability and organizing movements, and that we need only look back for inspiration in order to move forward. Are thinking about what self care looks like for the creative community in Houston. Jennie Ash: I want to refocus on working with artists within the scope of my position as Visual Arts Director at Art League, as well as work on an upcoming non-profit bar/art space project. Carrie Schneider: In the work I’ve done for Charge and in my teaching job, I keep coming back to equity in the arts hinging on the violence of an education system that dismisses entire zip codes of kids as having nothing to contribute, denies them arts education, channels them into limited career paths, and then sends wealthier whiter grown up artists (either who could afford expensive art schools or who are in huge debt for such a degree) into these same neighborhoods in order to quirk them up for property value enhancement. So I’m on the lookout for ways to break this loop. And I’m making art. For Round 44: Shattering the Concrete: Artists, Activists, and Instigators curated by Raquel de Anda at Project Row Houses, Charge has taken our launch statement at its word and built a table (collaged out of many tables) as the centerpiece for a series of gatherings that catch the sparks from Charge 2016.